This classic cable dress is great for both professional and evening wear. 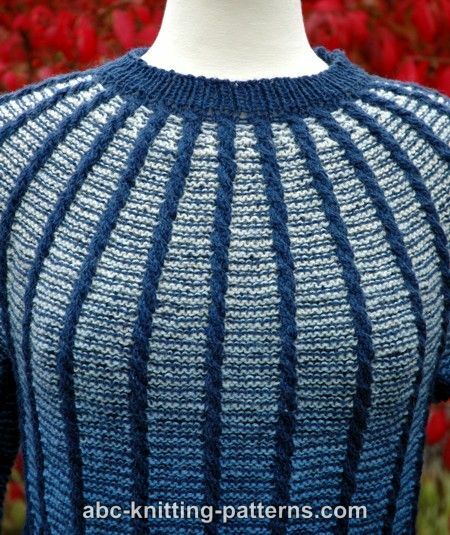 The cables add interest, and the vertical stripes create a slimming effect. I recommend at least some experience with cables before tackling this pattern. 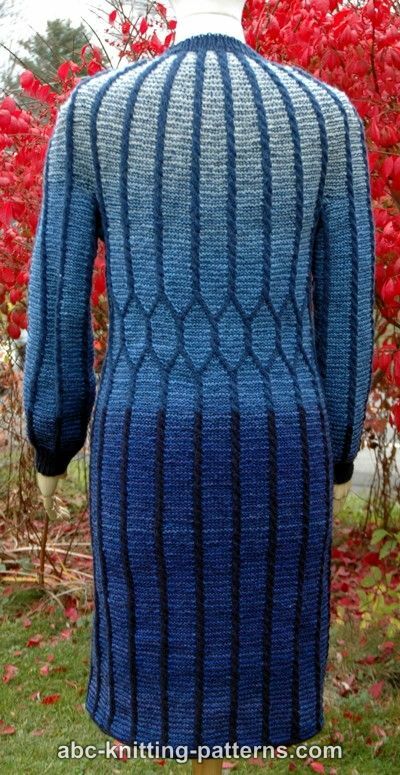 The dress is worked from the top down in a 2-color cable pattern, in rounds, without seams. Sleeves are also worked in-the-round. 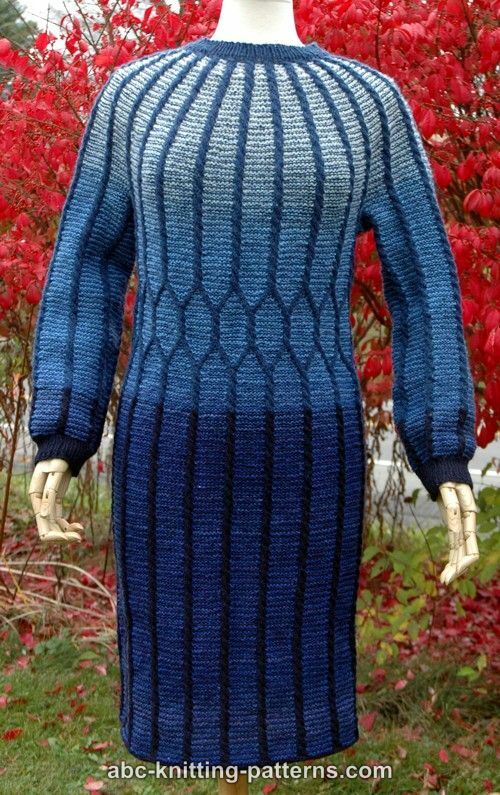 I used solid color yarn as the main color (cables) and self-striping yarn as a contrast color. The yarn I used has long color changes. However, it is possible to use solid color, hand dyed or self-striping yarn with shorter color changes. Just make sure the colors contrast enough to highlight the pattern. For sleeve you can also use circular 16” US 2 needles. The dress is worked from the top down, in rounds, without seams in a 2-Color Cable pattern (see above). The round yoke is shaped, by increasing the stitches between the cables. The waist is shaped with 2-Color Crossed Cable pattern. The sleeves are also worked in-the-round. With MC, using provisional cast-on method, cast on 115 (125, 140, 150) sts, join into a circle and continue work in rounds. 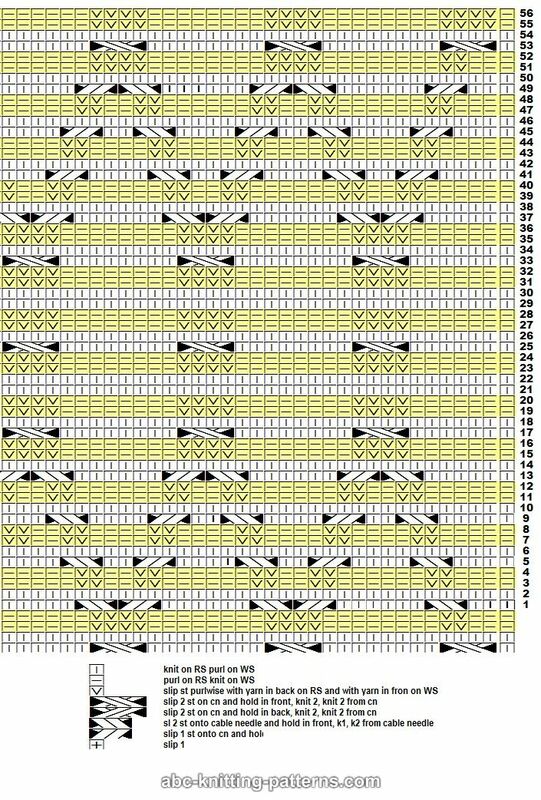 Start working the 2-Color Cable pattern (see above) in rounds with 4 sts for the cables and 1 st between cables (5 sts in 1 pattern repeat), there will be 23 (25, 28, 30) pattern repeats. Work 112 (120, 124, 132) rows. Make 9 increases in the stitches between cables increasing from 1 to 10 stitches. Make increases in rounds 5, 9, 13, 17, 29, 41, 53, 65, 77. Total at the bottom of the yoke before dividing for sleeves and bodice = 322 (350, 392, 420). Beginning of the round is between the left sleeve and the back. Place markers between each part. Next round: work back stitches (in 2-Color Cable pattern in rounds again), transfer right sleeve sts to a piece of waste yarn, cast on 19 (21, 24, 26) sts for the underarm, work front sts, transfer left sleeve sts to a piece of waste yarn, cast on 19 (21, 24, 26) sts for the underarm. Continue to work 2-Color Cable pattern in rounds. Total sts in bodice after division – 268 (292, 320, 332). Work as established for 64 rounds. 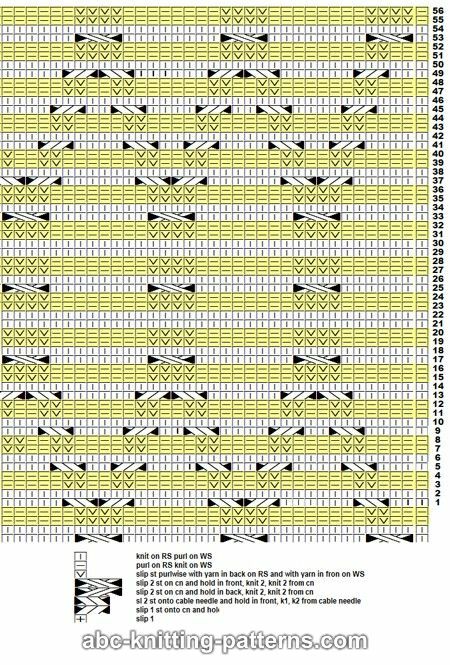 Work 2-Color Cross Cable pattern (see above) for 56 rounds. The 2-Color Cross Cable pattern shapes the waistline without increases or decreases, just because the gauge is slightly different. 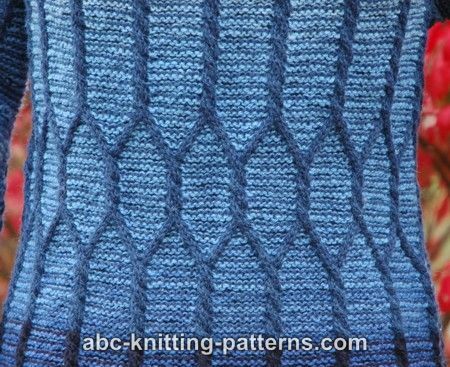 If you would like to place the waist line higher or lower, you should do it before starting the 2-Color Cross Cable pattern, keeping in mind that the pattern starts approximately 2.5” (6 cm) above the waist line. Continue to work 2-Color Cable pattern in rounds. Increase by 1 st in every pattern repeat in the next MC rounds to shape the hip line. Work the dress skirt as established to desired length. Bind off the stitches with applied I-cord in MC yarn..
See video instructions for knitting applied I-cord. Transfer sts from waste yarn to dpn. 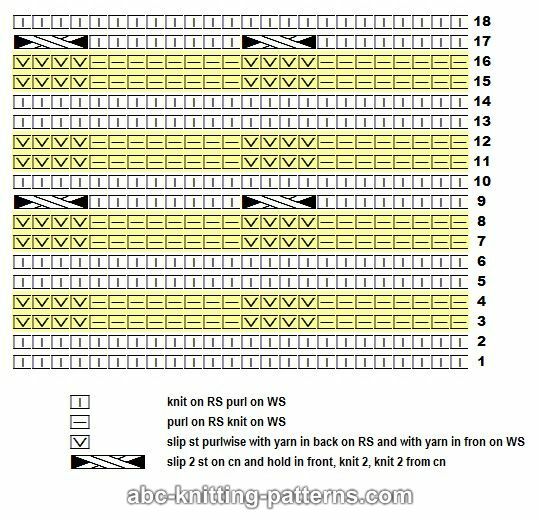 Pick up and knit 19 (21, 24, 26) sts underarm and 10 sts along the side of the 20 rows of the back. Mark the beginning of the round. Continue to work 2-Color Cable pattern in rounds. Work total 246 (252, 256, 256) rounds or to desired length, taking into consideration, that there is a 1” (3 cm) 1x1 rib. Work 10 rounds of 1x1 rib in MC yarn. Bind off. Remove the waste yarn from the neckline, pick up the stitches. Work 8 rounds of 1x1 rib in MC yarn. Bind off. I'm about to order the pattern but before I do, Ms. Phillips, I have to say that even for you this is an outstanding design. Beautiful! Thank you!